Grouping projects by client is helpful when you work with multiple clients, each of which may have multiple projects. You can also group projects by department, which is helpful when your team is divided into different departments, each of which may work on multiple projects. ■Note Internally, clients and departments are treated in exactly the same way: they're both ways to group projects. Because clients and departments are stored in the same table in the FogBugz database, each project can be assigned to exactly one client or one department, but not both. FogBugz installs with a default client named Internal and no departments. To use these grouping features, you first need to set up your clients or departments (or both). Log on as an administrator and click the Clients link to get a list of clients, as shown in Figure 3-9. These clients are available in FogBugz. • Click the edit icon or the client name to edit the details of the client. • Click the Delete icon to delete the client. Note that you cannot delete the default Internal client. • Create a new client by clicking the Create New Client link. 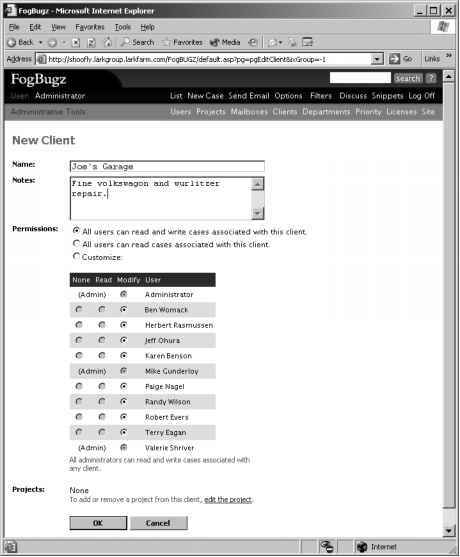 When you click the Create New Client link, FogBugz will open the screen shown in Figure 3-10. To create a client, you need to give the client a name and, optionally, some notes. Then click the OK button to create the client. You can also assign permissions on a user-by-user basis; I'll discuss permissions in the next section of this chapter. Creating a department works very much like creating a client. There's a department listing page that looks like the client listing page, and a department edit page that looks like the client edit page. In fact, they're pretty much the same pages, with the exception of saying "department" instead of "client" everywhere. After you've created the clients or departments that you need, edit your projects one by one. As soon as you create any clients or departments, the editing screen for a project will display a new drop-down list that lets you choose the client or department, as shown in Figure 3-11. This person will be assigned new cases in this project, by default. If you want to allow people who are not logged in to submit cases to this project from a restricted interface, choose 'Yes'. Accounting Maintenance write cases in this project by client or department. There are two main reasons that you'd want to group projects by client or department. First, doing so allows you to create a filter that lists all cases for a certain client or all cases in a certain department that you care about. Second, user access can be granted on a client or departmental level. This means that it's possible to create FogBugz accounts for your clients such that they can only see their own cases. You can also partition departments so that users can only see cases in their own department. I'll cover these techniques next.